When it comes to predicting the weather near you, you’re rarely going to beat the accuracy of your local weatherperson. But what happens when you’re on the road, away from home, or can’t get to a TV? That’s where weather apps come in. There’s a surprising number of capable weather apps on the market, but the truth is, not all weather reports are created equal. 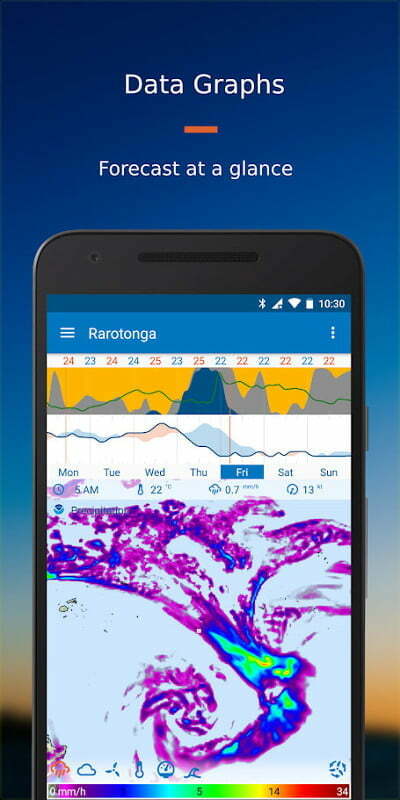 There’s quite a bit of variation between mobile offerings, with some reveling in real-time Doppler images and others emphasizing 10-day forecasts. Regardless of the particular focus, each app touts functionality designed to provide an all-encompassing weather forecast for your area. After all, even a good meteorologist can only tell you so much. 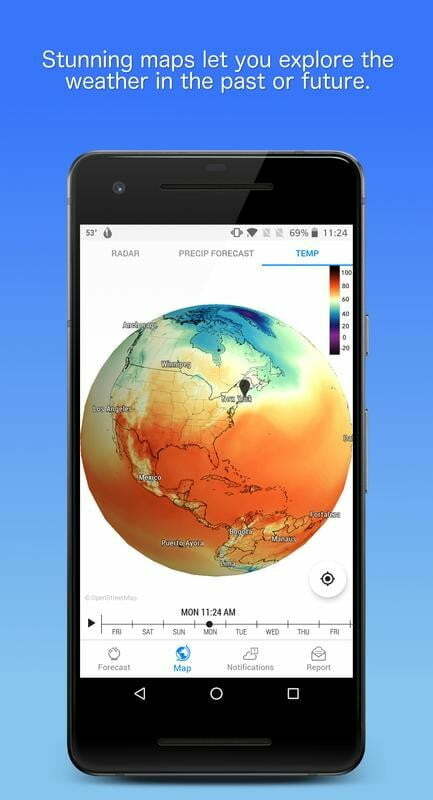 Here are our favorite weather apps for Android that provide comprehensive data, stunning visuals, and everything you need to ensure you don’t get left out in the cold. Using an iPhone? Be sure to check out our guide for the best weather apps for the iPhone. 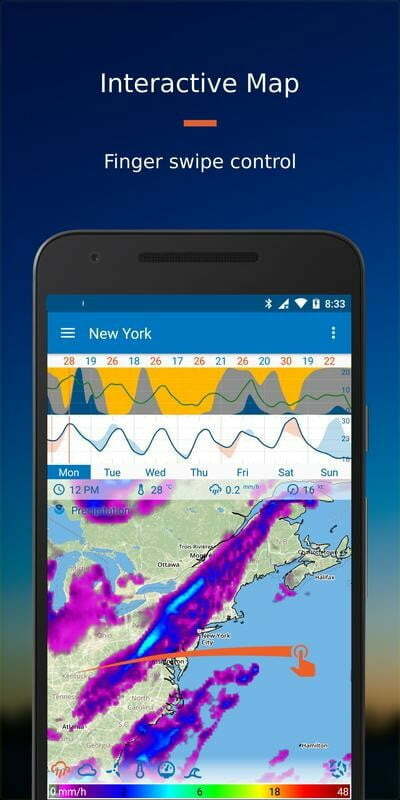 How could The Weather Channel’s app not make our list? It’s free, comprehensive, and has just about everything you need to keep an eye on the sky. 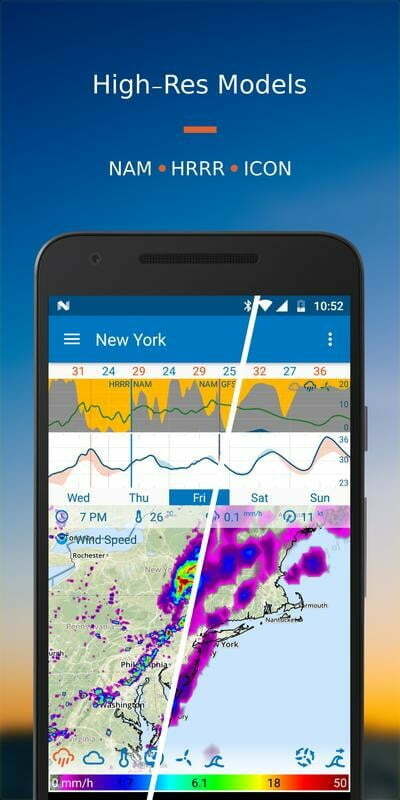 The app automatically changes based on your location and provides current weather plus hourly weather for the next two days and forecasts up to fifteen days in advance. 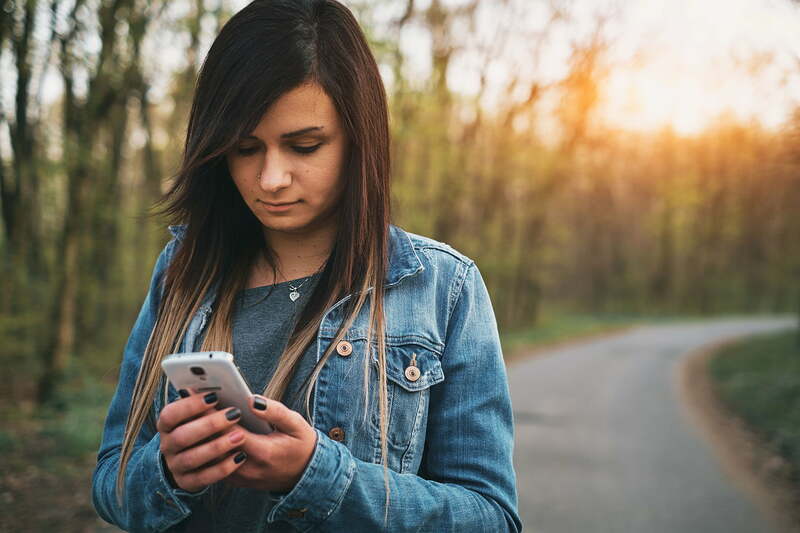 In addition, you can set the app to automatically notify you of severe weather alerts, as well as watch exclusive web content and videos recorded from the Weather Channel’s television broadcasts. 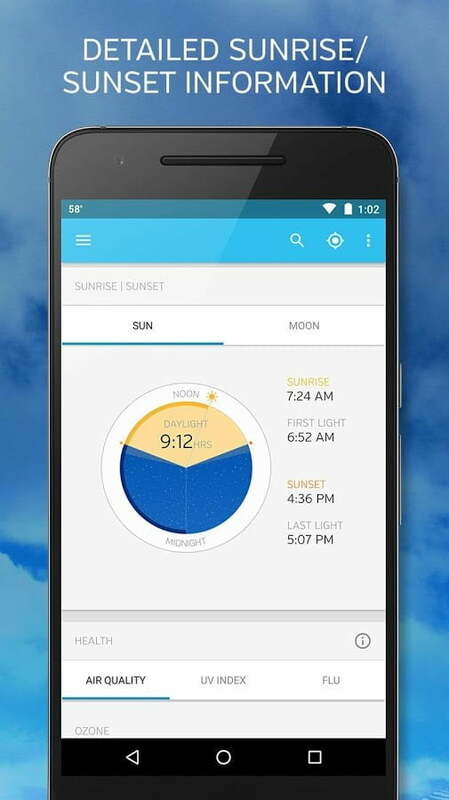 If you’re up early — check the app from 6-11 a.m. for “The Lift,” an app-first six-minute weather show detailing the day’s weather nationwide. 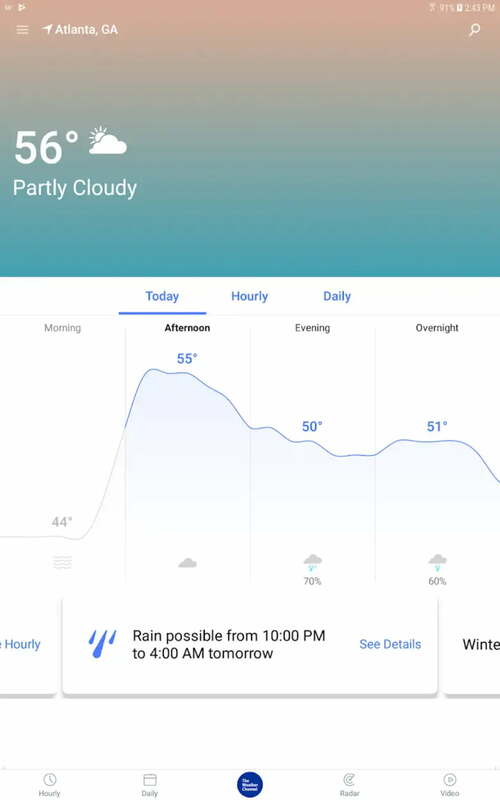 Android users get a dynamic home screen option that changes based on time, location, and weather (take that, iPhone users). The app tells you whether the weather’s right for a variety of outdoor activities, which change based on the seasons. Its weather maps are also fast updating, and while not as good as RadarScope Pro, lightning data is available, too. AccuWeather gets high marks not only for its simplicity but also for being comprehensive. 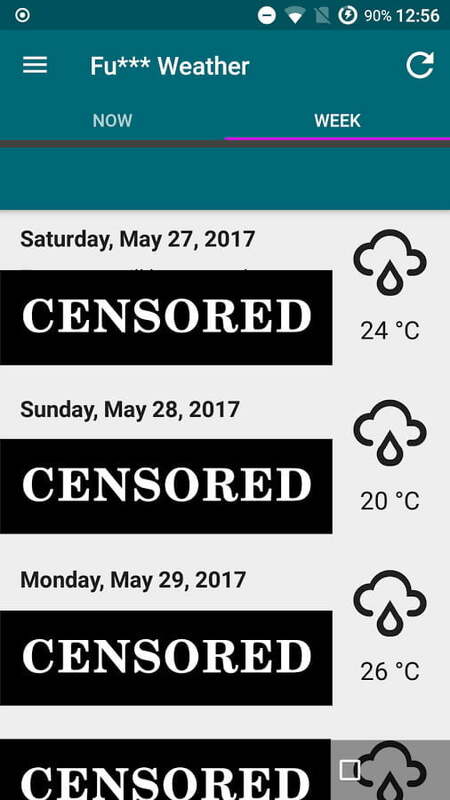 The app features something called MinuteCast, which is an attempt by AccuWeather to give you a minute-by-minute rundown of weather conditions up to two hours in advance. Hourly forecasts are available up to three days out, as well as a 15-day daily forecast. Other features set it apart from the rest, though. You’ll get information on allergies, sunrise and sunset information, as well as current weather news and videos. You can also send in your own weather reports and videos. AccuWeather might feature your videos in its news reports. 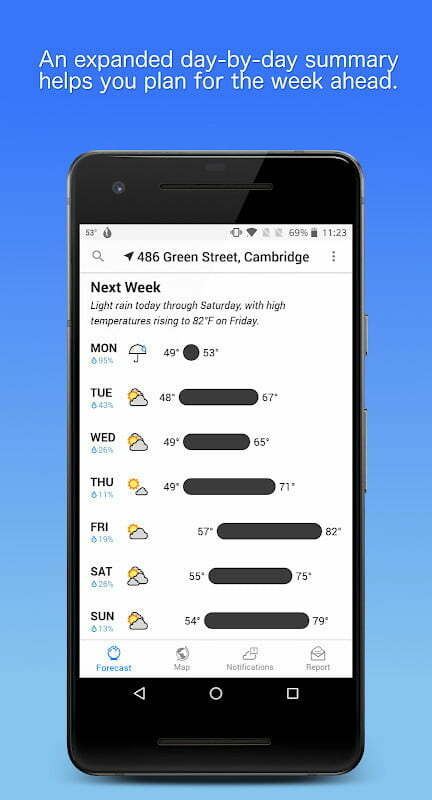 One of the iPhone’s best weather apps is also available on Android, bringing the hyperlocal predictions that gave it such a following in Apple’s walled garden. 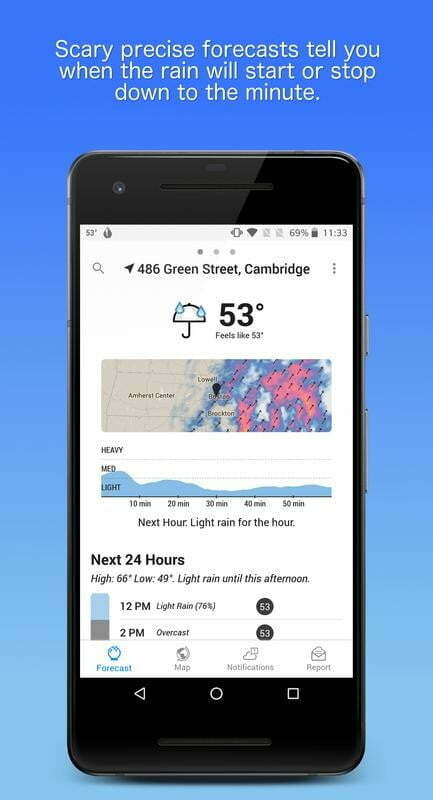 Dark Sky is one of the most detailed weather apps on the market right now, and it’s capable of informing users when the weather is due to change, down to the minute. While it’s hard to guess how accurate Dark Sky actually ends up being, its predictions aren’t bad at all, and one notification from Dark Sky can mean the difference between getting wet and staying dry. The best parts of Dark Sky come with a $3 annual membership, and that includes the “down to the minute” forecasting. But you’ll also get notifications, a home screen widget, and a daily weather summary sent straight to your notifications screen every morning. You can sign up for a two-week free trial of the premium features, so try it out for yourself. If not, the free version of Dark Sky comes equipped with daily and weekly forecasts, weather maps, and current conditions. Not bad for nothing. 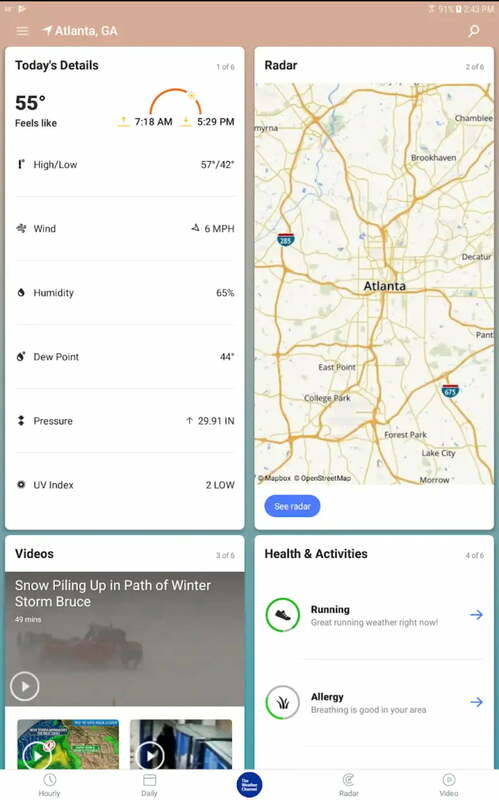 Weather Underground (now owned by The Weather Channel) is the web’s largest repository of online personal weather stations, meaning you’re likely never too far away from a local weather report. In addition to local weather data, Weather Underground’s app is pretty data-heavy. Presented in both text and graphical form, you can find data — both current and historical — on temperature, wind speed, daily rainfall, and even data on pollutants and current UV index. Forecasts are provided only 10 days in advance, a bit shorter than other apps and its parent The Weather Channel, but as we said, the focus is on data here. We’re also fans of the webcam section, which gives you a photo look at what’s going on, and “Wunderphotos,” its crowdsourced photo feature. Snap a photo yourself, and it might be featured in the app for others to see. Data nerds, you need to download this app right away. Want to see the whole week ahead in one go? There’s no app that does that better than Flowx. 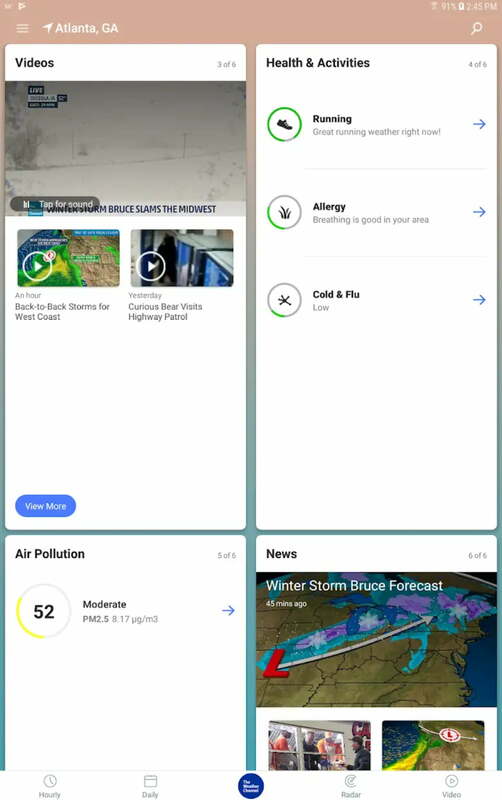 Simple swipe gestures mean you can browse through a whole week’s worth of weather on one screen, with details on wind speed and direction, as well as information from over 30 different types of data. If you’re a fan of weather data — and who isn’t? — this app gives you data in spades. There’s a travel mode so you can plan trips in advance, as well as widgets for your home screen, with graphs. A premium subscription gives you access to a longer 10-day forecast, as well as more data to consume, and the ability to edit weather graphs. You can get the Pro mode either by paying a one-off price or subscribing per month. Face it, checking the weather can be boring — but it doesn’t have to be. What the Forecast?!! tells you what the weather’s like in real terms, with humorous comments like “is this fedora weather? 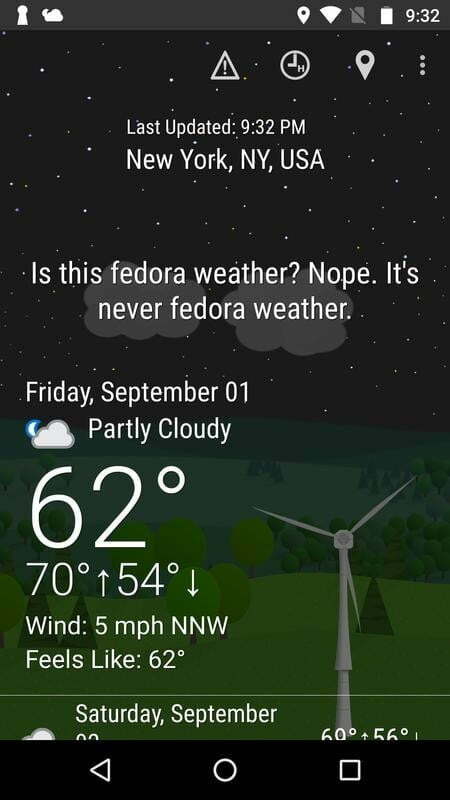 Nope, it’s never fedora weather” delivered alongside more usual weather stats. This goes a long way toward informing you about the weather than you might think, and having a little giggle at the new comment is often worth the price of admission. Which is, admittedly, nothing. You can toggle profanity on or off, or have it appear sometimes. 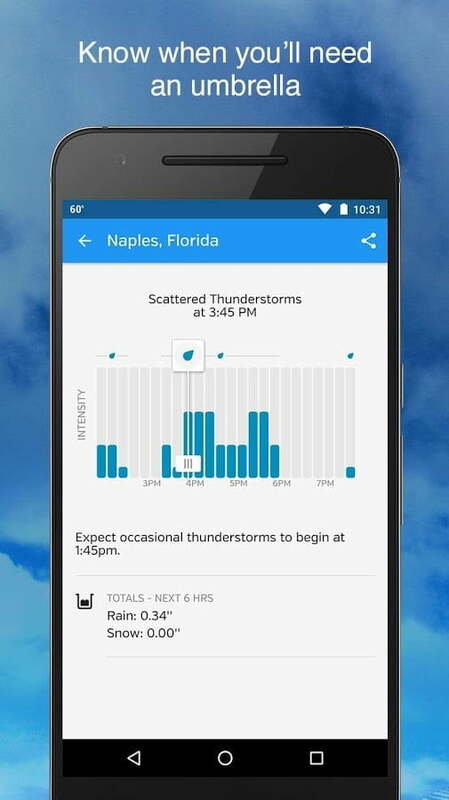 It’s also a pretty decent weather app, with the ability to forecast weather up to seven days in advance, as well as provide hourly forecasts for the next 48 hours. Also, if you find a pithy comment that really makes you laugh, there’s an option to share a screenshot in the app itself, which is nice. 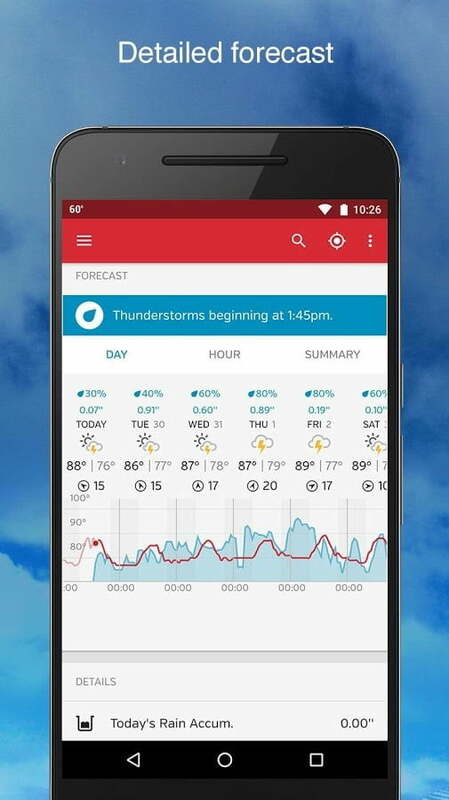 If you’re an outdoor enthusiast, storm chaser, or even somebody that just likes up-to-the-minute weather info, this is your app. 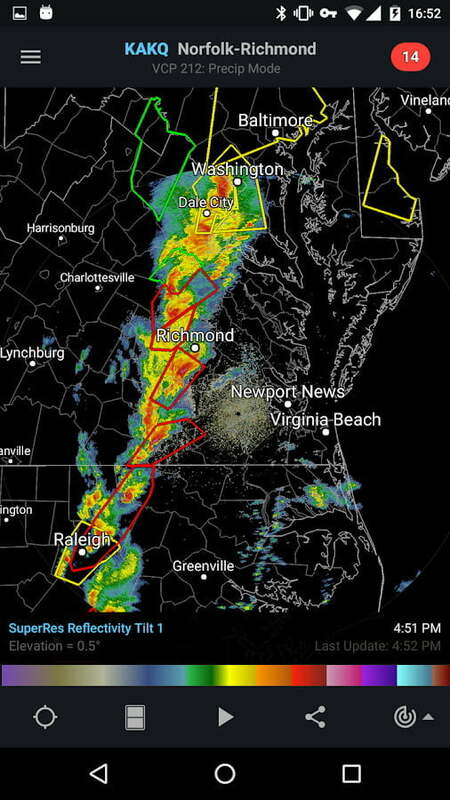 The radars refresh every six minutes, and storm warnings are placed on top of the radar images as well. You also have access to other radar products, such as velocity, precipitation estimates, and nearly a dozen other things, none of which are available through your standard weather app. 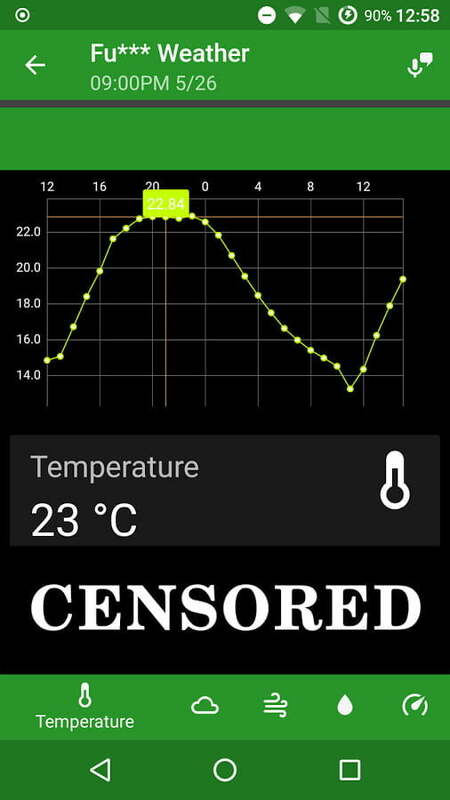 This app doesn’t tell you the temperature, nor is it going to give you a forecast. 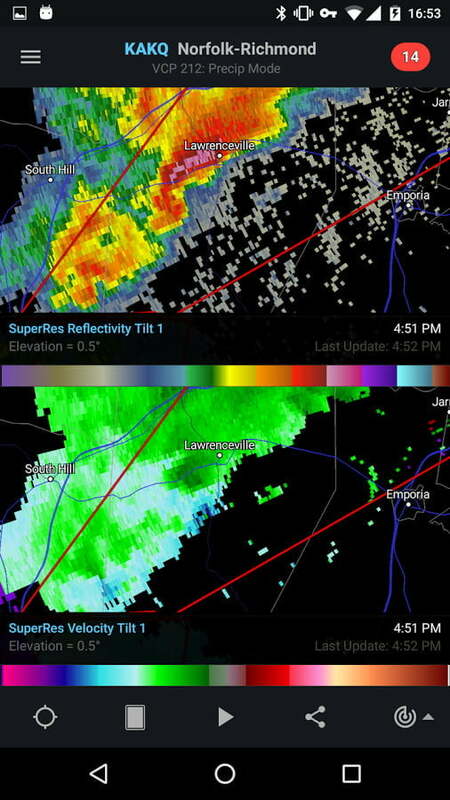 In fact, RadarScope is pretty one-dimensional when it comes to weather apps. It shows you the radar and that’s it, but you cannot get a better radar app from anyone else. At $10, it’s one of the higher priced apps, but it’s worth it. While it’s an additional expense, we recommend subscribing to RadarScope Pro. You’ll get the capability to add lightning data, dual-pane radar data (to view two radars at once), and loop up to 20 frames (two hours of data). It’s $10 per year, but that’s less than a dollar a month, and a must-have for those most affected by storms and rain. 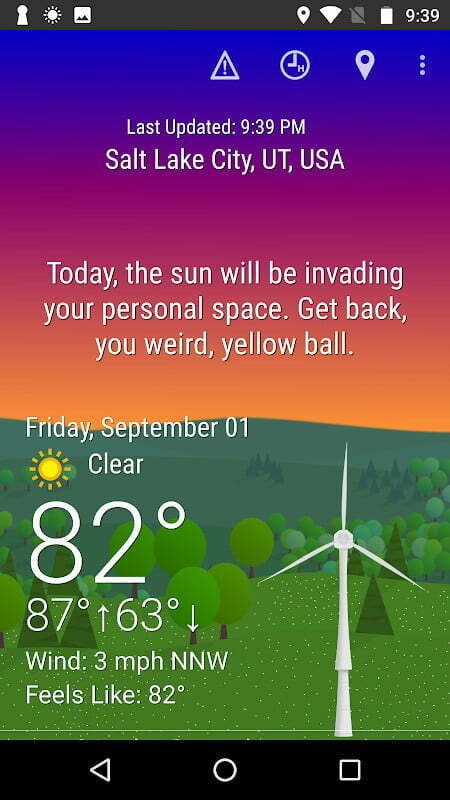 A lighter look at the weather, Fu*** Weather paints itself as something of a realistic weather app, based on what you might say when you actually see the weather outside. It should go without saying that includes some very naughty words indeed — this is not the app for you if you don’t like cursing. 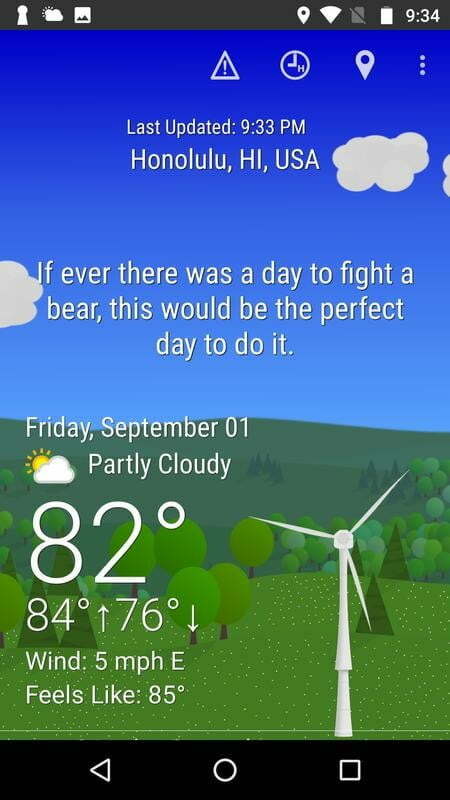 Comic purposes aside, this is actually a fairly good weather app. It contains your local weather conditions, hourly weather forecasts, and forecasts for a full week. 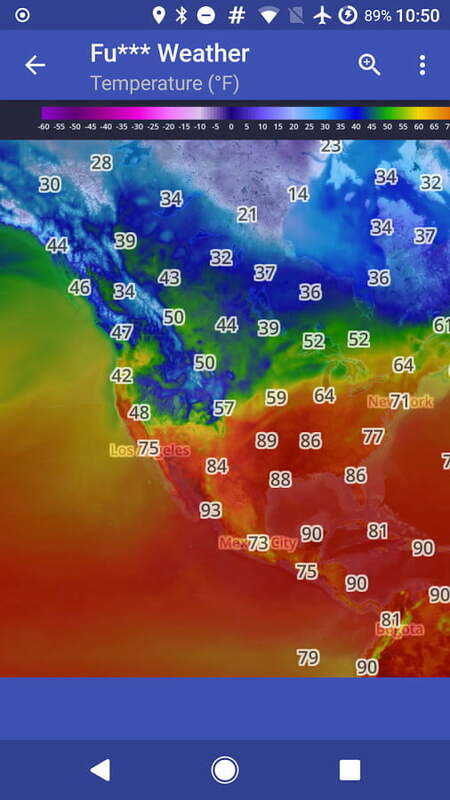 You’ll also be able to see maps for radar, satellite, wind, and more. If you want your weather at a glance there’s a home screen widget, while notifications keep you aware if nasty weather’s about to hit. If you’re a wearable tech sort of person, there’s an app for that too.